If you're interested in trying out the latest updates to Microsoft software, you might think that an Office 365 subscription would be the way to go. Wrong! Of late, Microsoft has rolled out new Outlook features not within its dedicated software, but on the Outlook.com Web site. That may point to a future where a more agile Microsoft pushes new features and updates onto the Web, rather than as dedicated updates which must be downloaded and installed by users. 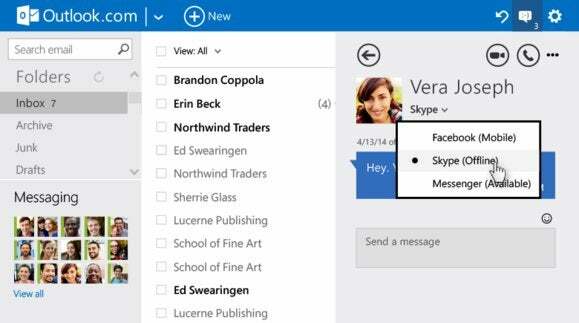 The new advanced rules within Outlook.com. That's not to say that the advanced rules don't appear in Outlook proper. (In Outlook 2013, Click File>Manage Rules and Alerts). In the app, Outlook provides several options either to create a new rule from a template or construct your own rule from scratch, with options as fine-grained as looking for specific words in the sender's address. 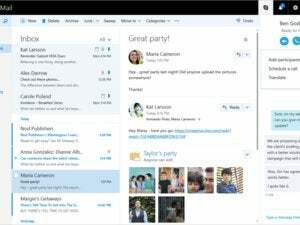 It's not clear whether Outlook 2013's rules will be more sophisticated than those found on Outlook.com, however, as the new rules won't begin rolling out to users for some time. Microsoft also added an "undo" feature to Outlook.com, so that emails that you accidentally deleted or moved can be undone in a quick tap of CTRL-Z or the Undo button. And in-line replies have also been enabled, mimicking the desktop software. Each contact will also pop up a quick list of which video and chat services they subscribe to, and whether they're online and available. Under Outlook 2013, users have to manually add details like their IM name. Now, it appears that Outlook.com will automatically add this data, from what it knows about you, and let you "opt out" by indicating that you're offline. We've asked Microsoft for clarification and will update this story when we hear back. "The following new features, which are rolling out today, build on our commitment to give your inbox new and better ways to do the heavy lifting and help you save time," wrote Mike Schackwitz, principal director of program management for Outlook.com, in a blog post. It's fair to say that features like undo and rules have been available in other Microsoft products for years, meaning that, on te one hand, Microsoft's free Outlook.com service is still playing catchup. But Outlook features like Sweep, a handy sort of HR spam filter for the office, have yet to roll out to Office 2013 or Office 365. Depending on your preferences (and whether your IT admin allows you to access your email via the site), you may find yourself jumping back and forth between the Web and the dedicated app.